I was watching the 49ers vs. Chargers game last night. 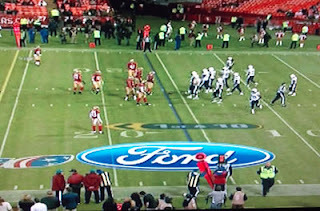 The Niners crushed the Chargers from the beginning so to me the more interesting thing from the game was the overlay ads that the NFL was superimposing on to the field. I remember how cool it was back in the late 1990s when the first down line was superimposed on TV broadcasts. But someone finally thought of a way to monetize this technology further by allowing advertisers to display their logos on to a big green field. What a great way to counter the DVR ad-skipping movement! Below is just one of the ads, from Ford, that aired last night. Throughout the game, there were also ads from Mazda, Go Pro, and Barracuda Networks. Barracuda actually had an interesting placement where their logo was shown when the Niners were in the red zone and a big red rectangle marked the 20-yard border around the logo. While this is a smart way to increase ad revenue for the NFL, I'm a bit mixed on it as a spectator because it looks tacky at times and gets us one step closer to the NASCAR ad-cluttered world in professional sports.